African violets are found growing in the soft, light, loamy detritus near creeks in the forests of Africa. They do not actually grow in dirt. To grow violets successfully as houseplants, you must replicate the growing conditions they enjoyed when they were weeds. 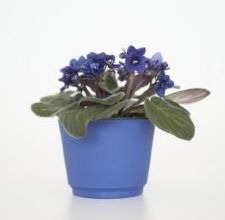 There are several pre-mixed and packaged African violet potting mixes on the market. They are easy to find, easy to use and are usually reasonably priced. When choosing a packaged African violet mix, there is one criteria. The bag of mix must feel as light and fluffy as a pillow, not as heavy as a sack of dirt. You can blend your own African violet potting mix. Like any recipe, there are variations with differing degrees of complexity. There are also regional differences. Potting mixes for areas with lots of overcast days will need more vermiculite or perlite so they will dry down properly. Areas that are sunnier and drier will have less perlite or vermiculite because the mix needs to hold moisture. Components that are often included are peat moss, vermiculite, perlite, limestone, charcoal, lime chips, horticultural grade sand or chicken grit. Brennan’s Orchids, LLC has used this formula with success: Mix 5 parts pre-mixed African violet potting mix, 1 part sphagnum peat moss, 1 part perlite and 1/2 part charcoal. Moisten the mix thoroughly prior to planting with it and let it drain. Always wet your mix with tepid or room-temperature water. If you use tap water, it is best to draw it into an open container 48 hours ahead of use and let the chemicals dissipate. Tamp the mix around your violet so that the mix is still airy and drains well but the plant doesn’t flop around when the pot is gently shaken.